MAURICIO PEDROZA: To everyone, watching on Facebook Live today, we want to hear from you. Leave your questions for the fighters, the promoters in the comments section below for a chance to have your questions answered live on the air today. So stay tuned for that. All right. Let’s get this started. Let’s go straight to our fighters, to our promotors and we go live to Guadalajara, Mexico. Both fighters have already started their training camps and we will introduce everyone around this fantastic fight. Joining Canelo from his gym in Guadalajara is his manager and co-trainer Jose “Chepo” Reynoso, his trainer Eddy Reynoso, and the and chairman and CEO of Golden Boy Promotions, Oscar De La Hoya who will open our press conference with a few remarks. OSCAR DE LA HOYA: Thank you very much. Thank you for having us. I want to express my gratitude to everybody around the world watching us live for the first time ever holding a press conference on Facebook. We greatly appreciate the support, and today, as of 10:00 in the morning, tickets went on sale. They are going extremely well, extremely fast, and we are grateful to all the fans who can be watching live on September 15 from the T-Mobile Arena in Las Vegas. I want to thank Team Canelo. I want to thank Team GGG for making this fight once again for the fans. The fans got to witness an incredible, incredible fight the first time around, and we strongly believe that the second fight will be a continuation, round No. 13, of their first fight televised live on HBO Pay-Per-View. The telecast does begin at 8:00 Eastern. This will give an opportunity for the fans across the globe to watch this fight at an earlier time. So we want to thank HBO and their teams. Mauricio Pedroza: Thank you, Oscar. Joining GGG live from the summit gym in bear, California is his trainer, Abel Sanchez and promotor for GGG, Tom Loeffler, who will also begin with a few remarks. Tom? TOM LOEFFLER: Today, this rematch really feels like it’s a much bigger event than the first time. There was a lot of controversy around the scoring for the first fight, and both guys don’t want to leave it in the judges’ hands this time. We’re up here where Abel Sanchez has his training camp in Big Bear, California. GGG is training to make a much more decisive victory over Canelo the second time around. You see we have all the titles here. GGG is the champion, and if Canelo wants to become a champion, he actually has to fight and try to take the titles away. So we are looking forward to seeing everyone September 15 at T-Mobile and on HBO Pay-Per-View. MAURICIO PEDROZA: Tom, thank you very much. So first question is for you, Canelo. What happened, and what would you like to say to your fans that were disappointed in you? CANELO ALVAREZ: The reason for the cancellation, we all talked about that. The main thing is the fight got here, the fight got done. I did it for the fans. This is the fight you wanted to see and come September 15, I can assure you it will be a much better fight than what you would have seen in May. MAURICIO PEDROZA: How disappointed were you the fight didn’t happen in May? GENNADY “GGG” GOLOVKIN: Of course we were all disappointed. I was disappointed and the fans were disappointed that this first May 15 bout didn’t happen, but right now everybody is happy that we all agreed to have this next fight on September 15. So both us and our fans should be happy. MAURICIO PEDROZA: Gennady, do you really believe the reason Canelo tested positive for clenbuterol was tainted meat? GENNADY “GGG” GOLOVKIN: First of all, I respect the fighters of the level of Canelo, and the fact that they screwed up, it was not my decision to disqualify him, and I think it was a team failure, but it doesn’t matter right now. It doesn’t matter right now. It’s important that we’re going to have a fight. MAURICIO PEDROZA: Abel Sanchez, do you believe the reason Canelo tested positive for clenbuterol was tainted meat? You were very vocal when this news first came around that Canelo might be suspended. ABEL SANCHEZ: We had been waiting for the commission to do their investigation, and come on, whatever the findings were, unfortunately they made a mistake. We have a fight on our hands September 15. They found him innocent of anything, any wrongdoing, so we have to go with that. My personal feelings have nothing to do or should have nothing to do with the actual findings of the commission. MAURICIO PEDROZA: But why are you saying you think they made a mistake? What mistake did they make? ABEL SANCHEZ: Well, they felt that he made a mistake. They felt that he ingested some bad beef. Hopefully this time that they are in Mexico, he doesn’t do that again. We’d like to have a fight on the 15th and the fans deserve that. MAURICIO PEDROZA: Even though your rematch against Canelo Alvarez says was cancelled, you still fought in May in Los Angeles at the StubHub Center against Vanes “Nightmare” Martirosyan. What were you trying to prove in the fight? GENNADY “GGG” GOLOVKIN: Well, because I like to be active, I like this box, I like this sport, and I like the fans. You know, the fans wanted me to fight, and why shouldn’t I? Why shouldn’t I fight, particularly on such an important day, May the 5th. MAURICIO PEDROZA: Did you watch GGG’s fight in May? CANELO ALVAREZ: Yes. Yes, I did see the fight in May. Of course I would. He’s the opponent that I have at hand and that’s my job to watch him. As far as what I thought about the fight, look, you can’t call that a fight. You have no opponent. That’s not my level of opponent. I didn’t pay attention as far as that being a fight. MAURICIO PEDROZA: Oscar, could you take us through the negotiations that have taken place over the last few months? OSCAR DE LA HOYA: The negotiations are the negotiations. The bottom line is that we have a fight. Obviously we know who the A side is, and that’s Canelo Alvarez. We obviously know that all of Mexico is behind Canelo Alvarez. Everywhere I go, everywhere we walk, the Mexican National is behind Canelo Alvarez, and I strongly believe that, look, Canelo going into the ring last, wanting to win those belts, for honor and pride. You know, he’s going to show it up in the ring, and we strongly feel that you know, it’s a big advantage and once that first bell rings, you know, we have a fight. So we strongly feel that, look, whatever the negotiations were, we’re extremely happy with and the fans are going to be even happier when they see a fight on September 15. MAURICIO PEDROZA: Tell us why is it so important for this rematch to take place on September 15? So important, that you had to put up your own money to make happen. OSCAR DE LA HOYA: Well, that was the big hail maker — I mean, you know, we can all here talk about percentages and this and that but there was a few things that I had to throw in myself. But the bottom line is, is that look, Canelo has the bigger piece of the pie, and because he’s the champion, he’s the draw. He’s the one that brings in the people. On September 15, you will have millions and millions of fans supporting Canelo and supporting GGG, as well. But this fight had to be made because we didn’t want to experience another Hagler/Hearns or Hagler/Sugar Ray Leonard because we didn’t see the second fight that didn’t take place. We didn’t want to see – like Trinidad and myself, we didn’t see the second fight. So this fight had to take place. The first time was a draw and finally we have it. September 15, will be such an important day for boxing. I strongly feel that the way this fight is going to turn out, the fans are going to be extremely happy, extremely proud and boxing will once again rise to the pinnacle of where it should be. MAURICIO PEDROZA: Why is it so important for GGG, for this fight to take place and to make the compromises GGG has had to take in order to ensure the rematch? For example, letting go of your position that the percentage for the rematch should be an even and even split. TOM LOEFFLER: On our side we know who the champion is. It doesn’t matter who is announced first. Doesn’t matter whose name appears first on the poster. GGG is the champion. He’s going to walk in with his belts and the important thing is he’s going to walk out with his belts. There were a lot of back and forth with the negotiations but again, we have to give both fighters credit. We have to give GGG credit. We have to give Canelo credit. We have to give Oscar and Golden Boy Promotions credit. The bottom line is, we are not just talking about the rematch. We are actually seeing the rematch happen September 15. A lot of fighters can’t even fight the first time, and here are two of the biggest stars in boxing fighting the rematch. Neither side wants to let it go to the judges. Canelo is predicting a KO. GGG doesn’t want to go through the same thing he went through last year in September — where his fate is in the hands of three people. He wants to make sure he controls his destiny and wants to make sure there’s going to be no question who walks out of the ring as the champion on September 15. MAURICIO PEDROZA: We heard Oscar describing why Canelo Alvarez is the main man in this fight, so why do you think you deserve a 50/50 split? GENNADY “GGG” GOLOVKIN: I always believe that and I know Oscar says, and I not always agree with what Oscar says. For example, I don’t believe all Mexico will be rooting for Canelo. I understand that all Oscar think that Canelo is the main locomotive behind this fight, but I think we’re both worthy of this fight. As far as the 45 to 55, yes, we made a concession. I think that we make a big concession, but I think it’s right now, it’s the most important thing that we are going to have a fight and our fans will love it. MAURICIO PEDROZA: Canelo, Gennady just said he doesn’t believe that whole of Mexico will be rooting for you. Do you agree, and why do you think GGG believes he has some part of the Mexican fans behind him? CANELO ALVAREZ: Look, I’ve always had detractors, regardless I’m fighting him or who I’m fighting. There’s always that side of the fans that are the detractors, but I have much more, many more, that love and support me. And now, that little respect that I had or that we had, it’s been lost, and come September 15, it’s just him and I in the ring, whether I have the support or not. It’s just going to be him and I, and he’ll see. MAURICIO PEDROZA: Now I want to go back to Oscar De La Hoya. As a fighter, does being in a fight like this motivate you more in training camp, especially when you just heard Canelo saying he doesn’t respect GGG anymore? OSCAR DE LA HOYA: Well, that’s exactly what a fighter needs, and that’s exactly why this fight is going to be such a great fight. Like Canelo said, the little respect they had for each other is out the window, and when you’re a fighter and you have no respect for your opponent, magic happens. Magic takes place inside the ring. You train harder in the gym. You run extra miles. You assure yourself that you’re in tiptop shape but more importantly it’s mental, the mental aspect of it is at its highest level. That’s why I think that these bullfighters are going to be in tiptop shape come September 15 and we will see an amazing fight. MAURICIO PEDROZA: As a fight fan and promotor, how excited are you for the fight and how excited shot fans be for the fight? TOM LOEFFLER: Not only as a promotor but as a boxing fight, this is the fight everyone is looking forward to. This is the fight the fans are looking forward to, that the media has been asking about. And GGG, I get a lot of comments, a lot of messages on social media from fans in Mexico saying, please knock out Canelo, don’t let it in the judges’ hands this time and GGG is going to come out that way. I know Oscar is down there in Mexico with Canelo. Make sure, Canelo, less Mexican meat, more Mexican style this time, September 15. Make sure everything goes the right way. There’s two warriors getting in the ring. The gloves are off this time around. Both guys, you know, feel disrespected by what happened last May 5, so I think the fans are going to win coming up September 15 when these guys get in the ring with each other. We just talked about respect. Gennady, how do you respond to this, to what Oscar De La Hoya had to say about you on May 11? GENNADY “GGG” GOLOVKIN: Oscar De La Hoya can say a lot of things, and it’s not always correct. As far as the money concerned, I’m a fighter, and I go and work, do my work. I fight. As far as Oscar De La Hoya, I suggest that he should take care of his own fighter and if he wants him to make more money, let’s have a fight. Put him on the ring. Abel, do you think Canelo has what it takes to knockout GGG? ABEL SANCHEZ: All those same things were said prior to the first fight and it ended up being a track meet. I think that on the 15th when Oscar and Canelo were having breakfast, Oscar needs to remind him, he needs to bring his courage to the venue that night because he’s going to need it. If he intends to knock out Golovkin, he’s going to have to fight him. And if he fights him, he’s going to get knocked out. I said that before; he would have gotten knocked out the first time, but he decided to make it a track meet that night. But if he comes to fight and if he comes to knock out Golovkin as he said he’s going to; if he doesn’t defraud the fans again, then he’s going to get knocked out. I’ve said it and I’ll say it again. MAURICIO PEDROZA: Canelo, you just heard Abel saying you didn’t want to fight the first time. I want to go back to you now and let you answer that statement because it seems like from GGG’s camp, you were never willing to engage during the fight. Will this time be any different? CANELO ALVAREZ: I did my fight. I did what I set out to do. I did what I trained to do but I did a great fight. But on September 15, I’m going to do the necessary adjustments and the necessary things to win. This man just likes to talk. He likes to talk a lot and bring up every excuse possible, but you’ll see, on September 15, what Canelo Alvarez is all about and what he’s capable of doing. MAURICIO PEDROZA: Gennady, you just heard Canelo saying that was his fight, that was his strategy, but he says it’s going to be different. How about from your side? How different is your strategy going to be to face with Canelo once again? GENNADY “GGG” GOLOVKIN: As the champion, I know my strategy and of course in this upcoming fight, a lot will depend on Canelo and the more Canelo had show, the more interesting will be the fight. MAURICIO PEDROZA: Eddy, why is your fighter the better fighter? EDDY REYNOSO: He’s a fighter with more arguments. He has more talent and is more versatile. He knows how to walk in the ring and make you miss, counterpunch, attack. I mean, he has the total package. MAURICIO PEDROZA: Chepo, what did you learn from that first fight that can expose GGG’s weaknesses? CHEPO REYNOSO: He’s an intelligent fighter and regardless of what people thought, I thought he clearly won the fight, clearly but come September 15, I can assure you two things. Not only is he going to take away GGG’s undefeated record, he’s also going to shut up Mr. Abel Sanchez. MAURICIO PEDROZA: Abel, you just heard Canelo saying, we’ll see a different Canelo, even Chepo Reynoso said we’ll see a different Canelo. What did you learn from Canelo Alvarez on the first fight, and do you think we’ll see a different Canelo Ãlvarez September 15? ABEL SANCHEZ: Well, in the first 40-some fights we saw Canelo fight, he fought a totally different fight and he promised the fans he was going to give them the same type of action against Golovkin. After the first couple rounds, he found out he couldn’t. I hope September 15 coming up is different because I think the fans deserve what we have been promising them. Golovkin fights in his style. He’s the champion. He’s going to go at Canelo, and if Canelo thinks he can knock him out, then I think we’ll see a classic fight. It doesn’t matter how smart Canelo is, when he gets hit and he get hurt, he’s going to be knocked out. Smarts have nothing to do with it. He’s going to get hit and get hurt. MAURICIO PEDROZA: Several times Sanchez called Alvarez a cheater after all the controversy surrounding his suspension. How did that make you feel, and what do you think of Abel Sanchez as a trainer? CHEPO REYNOSO: I think Abel Sanchez likes to talk. He talks too much. At the end of the day it’s going to be Canelo Alvarez and GGG fighting with their fists and not with their mouths. He likes to be the star of the movie, and it’s not him. This is about Canelo and GGG. And what we need to do as corner men, as trainers, is do our job quietly because it’s not about us. Abel, learn to be quiet, please. MAURICIO PEDROZA: Oscar, what have you seen so far from Canelo’s team and the way they are preparing for September 15? OSCAR DE LA HOYA: Well, it’s clear that for team canal low, it’s a totally different mind-set. It’s a totally different fight. Just being an ex-fighter myself, I know what type of preparations you must do in order to fulfill your goal, to fulfill your goal come September 15 against GGG, and I can assure you, I mean, it’s clear that Canelo is in a stronger state of mind. There’s obviously bad blood, and therefore, that’s why it’s going to be an amazing fight. Look, Canelo, yes, he can box. He can move. He’s the more skillful fighter. He can do all that stuff, but he can also fight. And GGG hasn’t seen that, but I’ll assure you one thing: Come September 15, it’s all business. It’s all going in there and proving not to everyone who is watching but proving to GGG that he’s the better fighter. So will Canelo be in different shape? Will he be in better shape in will he be stronger, faster? He’s going to be all that, and then some. So on our side, we strongly feel they haven’t seen Canelo the way they are going to see him September 15. We have seen GGG. We know what he does. All he does is come forward and fights and that’s it. Canelo has many other things he does, so come September 15, you’ll be able to witness them. MAURICIO PEDROZA: Oscar, I want to give you a chance to respond to one of Tom’s comments, also Gennady’s comments, when they say that Mexico is actually split. It’s divided. Not everyone is rooting for Canelo, and some Mexicans are rooting for Gennady Golovkin. OSCAR DE LA HOYA: Everybody has their fans. Everybody has their fans. There’s a reason why when Canelo fights on HBO Pay-Per-View, which he’s the only Pay-Per-View star in boxing, there’s a reason why they support him. There’s a reason why he generates the numbers he does. There’s a reason why the gates are so high. There’s a reason why the numbers are so high. Look, every fighter has their naysayers, and every fighter has their non-supporters, but the truth of the matter is that Canelo has millions and millions of fans all over the world just like GGG. But we have to recognize one thing; that Canelo is the Mexican champion, the star of Mexico, the star of boxing. MAURICIO PEDROZA: GGG, you just heard Canelo Alvarez saying how he has lost some respect for you. Let me ask you something. Have you also lost respect for Canelo Alvarez, the boxer, or even the person? GENNADY “GGG” GOLOVKIN: Respect is respect. We have different mentality. We have different understanding of what respect is. I think Canelo team, by doing what they did, and they lost some respect from their fans. But it’s not important. I do have respect to all the fighters, all the athletes, all the champions who fight at this level, and I think at the very end, we will find a way to shake each other’s hand, regardless what the outcome, regardless what we think before the fight. As two men, we should be able to stand against each other and shake each other’s hand at the end. MAURICIO PEDROZA: I remember before the first fight, you both were behaving in a very respectful manner. Why does this time feel like more personal to you, actually to both of you, but for you, is this personal this time? CANELO ALVAREZ: Yes, absolutely, it’s changed, totally. They disrespected me for everything they have been saying, everything they have been doing, all their actions. Now it’s different. It’s personal. MAURICIO PEDROZA: A lot has been said from both camps about you and GGG, but one of your biggest critics so far is Abel Sanchez, and you haven’t really talked to him yet, so we’ll give that you opportunity to address him correctly. What do you want to say to Abel Sanchez who is listening to you right now live? CANELO ALVAREZ: I have nothing to say to him. He knows what I think of him. MAURICIO PEDROZA: Abel, what do you think about Canelo? He’s listening now. You’ve talked a lot about him, as well. ABEL SANCHEZ: I talked about him because of what his actions have been and I think the consequences it has caused for us as a team here, the GGG team. He’s an exceptional fighter. Two guys at the top of their game are going to duke is out on the 15th. I hope we get the kind of fight that we are expecting. MAURICIO PEDROZA: Gennady, is there anything you would like to say to him? GENNADY “GGG” GOLOVKIN: Well, I want to tell him that we should be ready for the fight. You know, we should be ready for his fight for us. We should be ready for his fight for our fans. We should get ready. I think we should both be in the best shape for this fight, and the better we will be for this fight; the more, the sweetest taste the victory will have for us. MAURICIO PEDROZA: Canelo, you have the floor. What do you have to say to Gennady Golovkin? CANELO ALVAREZ: Nothing. We’ll see you September 15. MAURICIO PEDROZA: And to all of you watching, is there anything you would like to say to GGG? Is there anything you would like to say to Canelo? Let us know in the comments section below for a chance to have your questions answered directly. But before we check out what the fans have been posting in that comments section below, let me ask you one question to all of you in our Facebook Live broadcast. I want to start with Gennady Golovkin. Why aren’t we all hanging out in the same room? Why are you in Big Bear, California? Why is Canelo in Guadalajara, and why aren’t we shaking hands in person? GGG, I’ll start with you. GENNADY “GGG” GOLOVKIN: We are in a space, we are in a room where it’s best for all of us and which is more comfortable for all of us. It’s better to meet on September 15 and show all the best of what we can demonstrate. MAURICIO PEDROZA: Canelo, usually when we are promoting a fight, we have both boxers looking at each other, sometimes shaking hands, sometimes having a little more action than that. Why didn’t you want to face Gennady Golovkin before September 15? Why didn’t you want to be in the same room with him at the same time? CANELO ALVAREZ: I assure you we’ll see each other face-to-face before September 15. We already got the tour and we already got the promotion. It wasn’t necessary for this one. But I’ll see him very soon. MAURICIO PEDROZA: That’s fair. Well, we certainly have a lot to look forward to this September 15. In just a moment, we will open the phones to ask questions from members of the media. Q. This is for Canelo. As a Mexican, do you believe Abel Sanchez deserves a handshake? Can you actually shake Abel Sanchez’s hands? CANELO ALVAREZ: He deserves that and much more. Q. Canelo, real quick, do you feel like the things that Abel and Gennady are saying to you about making this a toe-to-toe fight just a tactic to draw you in, when it may make more sense for you to box yourself to victory in this fight? CANELO ALVAREZ: Yes, that’s probably their tactic. You know what, the sentiment that I have inside of me, it’s going to help me a lot, intelligently, to bring out what I have to do. I know what I have to do. Q. This first question is for Canelo. There are lots of rumours that have spread around about you wearing a knee wrap in different pictures. Is there anything wrong with the knee and can you address that? CANELO ALVAREZ: Simply put, it’s a brace just to support. I’ve been training really hard. It’s part of rehabilitation and I’ve been working really hard, and that is not going to be a problem, trust me. Q. The numbers from your last fight show that GG out-landed you by 49 punches and out-threw you by 198. Do you feel that you need to increase your work rate in order to win the rematch? CANELO ALVAREZ: Yes, that’s part of the plan and part of what we are working on. Yes, we know what we have to do, and yes, we have to throw more punches. To win fights, you have to throw punches, and that’s what I do in all my fights. MAURICIO PEDROZA: Now it’s time to take a look at the questions and comments for the fighters and their teams on Facebook Live. We’ll go straight to that. We’ll start with Rob. Q. Asking them both, what will be the difference from the first fight? Gennady, what do you think will be the difference from fight No. 1? 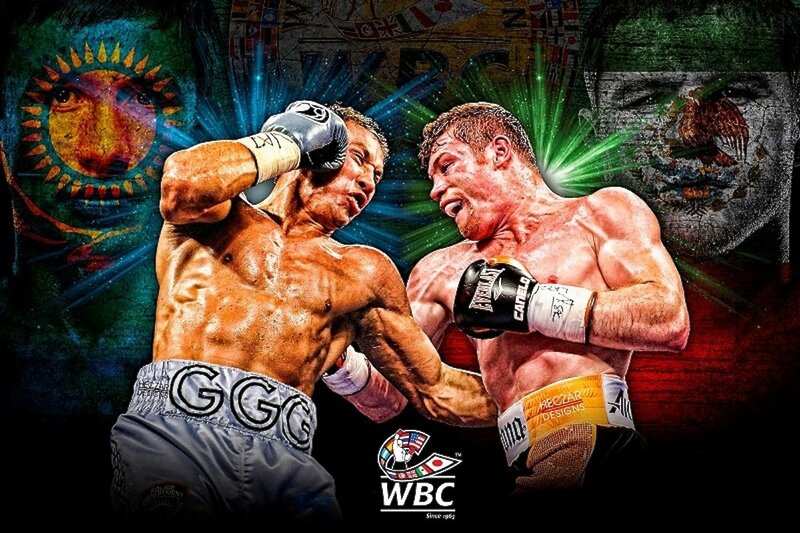 GENNADY “GGG” GOLOVKIN: I think this fight will be interesting. It will be tougher fight. It will be fiercer fight and I think we made our conclusion from the first fight, and this fight will be more colorful and more interesting. Q. Canelo, what do you think the difference will be from the first fight? CANELO ALVAREZ: Without a doubt it’s going to be a different fight. It’s going to be a better fight. Look, we know what we have to do. I’m going it take even a stronger strategy, a better strategy, and it’s going to be a much better fight. We already know each other. Now we know what we have to do. Q. To Team GGG, are you doing anything different in this camp from the last time you fought Canelo? ABEL SANCHEZ: We prepare ourselves and we prepare Gennady to be the best Gennady can be. We won the first fight. A lot of people know we won the last fight. He knows he won the last fight. Some adjustments obviously will be made in camp but Gennady fights in a style that is not only fan-pleasing but a style that he has mastered with a 23-knockout streak, in, what, 20 defenses, making it the 21st on the 15th. I think that’s the best in history. He’s tied Hopkins’ record. He’s got a knockout ratio, the best in middleweight history. I think the changes are going to be minimal. But I think it’s all going to defend if Canelo brings his courage. Q. Gennady, are you doing anything different for this second fight, this rematch? GENNADY “GGG” GOLOVKIN: No. As always, I’m going 100 percent what I need to do and I’ll be ready 100 percent for this fight. Q. Can you talk about your impressive footwork and mobility in the first fight, and now that you’ve had surgery on your knee, do you think your footwork might be even better in the rematch? CANELO ALVAREZ: That’s always been part of my arsenal. I know how to move inside the ring. The knee is not a problem. We’ve been working hard now and we’ve been training here and it hasn’t given me any issues and if it does come up during the fight that it gives me problems, we’ll already have a Plan B, a strategy, behind that, as well. MAURICIO PEDROZA: Thank you, everyone, for joining us today watching this special Facebook live GGG special event. A reminder that tickets for September 15 are on sale now and they are going fast. You can also join Canelo GGG September 15 live from the T Mobile Arena on Pay-Per-View. Canelo vs. GGG 2 is a 12-round fight for the middleweight championship of the world presented by Golden Boy Promotions and GGG Promotions. The event is sponsored by Tecate, “THE OFFICIAL BEER OF BOXING,” Hennessy, “Never Stop, Never Settle,” Fred Loya Insurance, Interjet, Venom, and Fathom Events. The event will take place Saturday, Sept. 15 at T-Mobile Arena in Las Vegas and will be produced and distributed live by HBO Pay-Per-View beginning at 8:00 p.m. ET/5:00 p.m. PT.